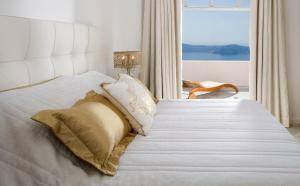 The Gold Suites is located in Imerovigli, right on the Caldera cliff. 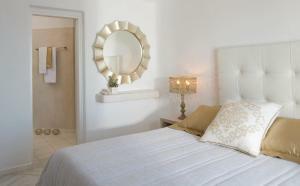 It offers full views of the volcanic crater and modern accommodation with traditional details of the Cyclades. This spacious open-plan suite offers luxurious décor and views of the caldera. It has an open-plan bedroom with a queen-size bed and a bathroom with a rain shower. This spacious luxury suite features a large private veranda with a heated hot tub, sun loungers and views of the caldera. It has an open-plan bedroom with a large bed and a living room. This spacious suite features a large veranda with a private heated pool, sun loungers, a dining area overlooking the caldera, and an open-plan bedroom with a king-size bed and lounge. This elegant suite features a private outdoor heated pool, elegant lounge chairs and views of the caldera. It has an open-plan bedroom with a king-size bed and a living room, a bedroom with a rain shower and a hammam and a dressing room. This suite has a luxurious décor and views of the caldera and the volcano.